Who would have thought that relationships and their ripples would have such a profound impact on life, everywhere? Relationships present an opportunity to evolve in one’s own relationship, along with all others equally, as it is the consistency and willingness to keep going deeper with oneself and others that keeps us evolving. It’s our relationship with self-love, and the level of care with which we handle ourselves and move our bodies, that allows us to naturally be this way with others without the need to try. Some may say they have forgotten how to be in a relationship, especially if they have not had a partner for a while, but actually from my own experience we are always in relationships, not only romantic relationships. What matters is how we treat, care for and respect ourselves, as this is what we are then able to bring to all our relationships with others. It was not until I brought my attention inwards to self-reflect that I really started to get a sense of what this is all about. My life consisted of focussing on my work first and foremost, and so long as I was able to fit in everything I had to do, along with the ‘to do’ list I always had with me, then I was managing life. But because I was so exhausted there was a limit to the depth of quality I could bring to all areas of my life. So clearly things needed to change. Having lived a busy, hectic life with work, I started to create quiet time – ‘down time’ I called it – that helped me to stop and really consider that the way I had been with myself was not what it could be. I decided to make my life simpler by making choices to go to bed early, wake up early, eat healthily, rest, swim, all with the awareness that I needed to be more gentle with myself. After building a relationship with myself in this way, I started to realise that being in relationships is not as one might think, nor what one might be initially open to. Take for example: you wake up in the morning and you are still carrying something unresolved from the night before and maybe even the night before that. How do you think or feel your movements will be with yourself while you get ready in the morning? Possibly anxious, angry, sad, confused, unsure, disturbed, out of sorts etc…? So what about if you live with another, how would you be with them at this time? More than likely the same, or trying to hide that this is going on, or you may feel the need to release it on to them. I have experienced being on the receiving end of this, but I have also been the one acting in this way. What I have observed are the ripples that this has on my day and then on all those around me – whether I have received it or created it, the results are the same. So let’s turn this around: what would the day look like if we started free of all these emotions, and instead were full of joy? Would we enjoy getting ready and spending more time on ourselves perhaps, preparing for the day to come, enjoying connecting to whomever we see in our day? This is now becoming my normal way of living. I start full of energy, wanting to get stuck into my day, loving getting ready, while really enjoying connecting with myself and others before leaving for a full day’s work that feels effortless and easy, making me feel like I can handle anything thrown at me. The ripple effect here allows others to do the same, by showering an energy that reflects to them a different way of being that can inspire them to let go of negative thoughts and emotions. Children can often be seen to respond to this rejuvenating way of being. We all can feel that the energy in a whole room can change as the positive ripples are felt, so why would we not choose this way of living? Changing ill behaviours into loving, respectful and harmonious ones can be challenging, especially if we are not willing to see that some, if not all of our behaviours, are in fact creating a ripple effect on our own lives and on society. We need to create stop moments in our day to really consider how we are truly living on a moment to moment basis and the effect that this has. If someone had sat me down and told me that by being a certain way we create a different ripple effect, I would not have understood, and most probably would not have seen the importance of being responsible in all my relationships. The willingness to see how we live and the commitment to consistently be honest does create ripples in our relationships. After starting to establish a certain quality, i.e. living with a deeper level of self-worth, respect and gentleness with myself, I have then been able to bring those qualities to all others and begin to build more intimate relationships all round. As a Londoner since 1981, born and bread one could say I am an expert of it, how I am still uncovering the magic that oh so exists! My long term passion/career in hairdressing, now all of 21 years has and continues to show me how I love people, being creative and how I will never stop. Your honest look at how you were living and how exhausted you were got me thinking about how exhausted people in this world are. We are not honest enough with ourselves to realise how exhausted we are and that it has become almost normal to be this exhausted. I remember when I stopped gluten/dairy/sugar and people were like ‘you must be feeling amazing’ and I was like, nope, I am actually starting to feel how I truly am without the dulling/propping up of gluten/dairy/sugar and I am exhausted! From getting honest, I could then start to build a more loving and caring relationship with me. Reviewing and adjusting just one of our behaviours, such as how we eat, prepare for sleep, use our ‘down time’ etc. can have a huge effect on our whole life because it brings any neglect or disregard to the surface that is hiding in the other ways we live. The one relationship we have to work on is the relationship with ourselves. If we fall in love with ourselves, find our true love, we fall in love with other people, all people as well. It’s so interesting to consider that we are raised to not consider the ripples we put out – we are raised to perpetuate irresponsibility in a society that appears to value irresponsibility over the awareness of our actions. The way we live has potential to transform lives: it is alchemy in action. “What matters is how we treat, care for and respect ourselves, as this is what we are then able to bring to all our relationships with others.” A real and reflective sharing of the ripples that we offer and reflect in life and how our commitment to how we live and are effects everything and the responsibility we have with this . I am starting to understand more and more that if I have had a hard or difficult day or feel tired I might think I have a right to be grumpy or irritated but this actually has an impact on everyone around me and is a drag rather than a support for them. How we are with ourselves is certainly reflected to another and this is a huge consideration in relationships. I know that I am a direct reflection to my husband and our kids, but that also our family becomes a reflection to our business and friends we have around us. So there is a sense of responsibility and how we truly embrace this in relationships, knowing the solid ripple effects we are delivering. Relationships are definitely like the proverbial pebble being dropped into the pond, the ripples flow on out, and if they come up again an object they simply begin to flow back again. So, if we ‘drop’ anything into a relationship, whether it be with ourselves or others, those ripples naturally flow on out, ripples which are either harming or healing; it’s always our choice as to their quality. The choice to heal or harm is given in each moment we express. The ripple effect is often not noted but is part of the process – let us not forget! “The willingness to see how we live and the commitment to consistently be honest does create ripples in our relationships” This is huge, and actually a lot more simpler then we think, Being honest is so dame good for us. Its the foundations for a truly joyous successful life. When we have tasted true freedom how could we want it any other way. This is what I’m discovering our relationship with self-love, and how this affects not just ourselves but everyone around us. It feels as though the more we surrender to ourselves and deepen our self love the more we are able to include everyone in this so that no one is left out we all get to experience the love. Imagine if everyone decided to take the journey of discovering self love the impact this would have on humanity would be massive. ‘We need to create stop moments in our day to really consider how we are truly living on a moment to moment basis and the effect that this has.’ I can feel how supportive these stop moments would be in our day and I feel inspired to create these movements in my day. ‘Relationships present an opportunity to evolve in one’s own relationship, along with all others equally,’ My goodness, without the reflection of everyone I am in relationship with I would certainly not know myself as well as I do. Every relationship is a point of reflection of where I am at, what I need to work on or a confirmation. They also present opportunities for me to offer the same to others. We really cannot do life on our own and I have so much appreciation for everyone I know because of this. So true Michelle, building our relationship with ourselves is the best start we can make, because once we know who we are, we can build relationships with others. Our movements are indeed ripples of vibration where our quality either harms or heals. ‘Changing ill behaviours into loving, respectful and harmonious ones can be challenging, especially if we are not willing to see that some, if not all of our behaviours, are in fact creating a ripple effect on our own lives and on society.’ For not only do we feel the impact on our own body for how we behave, the whole world around us feels that too. To consider what we are contributing to is so important. I have increasingly observed how comfortable I have been to keep things at a certain level and have been reluctant to dig deeper, to deepen that love, respect and harmony. This is my challenge. In just nominating this I know that a crack will develop and with time it will get wider and so whatever hurt I am protecting that prevents me from going deeper will rise to the surface to be dealt with and let go of. In understanding that my choices are impacting others, even if I can’t at first feel it in myself, allows me to give myself permission to be open to looking at it and to feeling it. I love this sentence Amina ‘Relationships present an opportunity to evolve in one’s own relationship, along with all others equally’. Most times we don’t even notice or appreciate the ripples we send with our own relationships to others either but that reflection of how relationships can be when seen in another is priceless for us to learn how to be with one another. Yes the ripples of life, something that many of us neglect to consider, but just as a stone creates ripples in a pool, so do we in life and they keep on going, so indeed what is the quality of them? It’s actually a joyful consideration not a burden as I have often thought of it, and have many examples of how this plays out in life. We need to take responsibility for the ripple effect that we have on others because at a fundamental level we are all the same. One place you can always feel the ripple effect is in the workplace. How often do office disagreements, personality clashes and power struggles play out and affect everyone in the building? What a story – a bunch of God’s who made up stories about all-powerful beings ruling the world when all along the power was inside them and their every move. The gods who used their godly powers to pretend they were paupers! ~ just to avoid the truth. The ripple effect does really show us the responsibility we have to all others walking this planet. If I am living in a way that exhausts me, which I have been most of my life how can I possibly do my best work which then energetically effects everyone that comes in contact with everything I do. In every moment we are reflecting a quality of vibration through the quality of space we occupy. What are we aligning to and what is it that we are offering by way of our reflection? Whether we are willing to be aware or not we are always contributing to the way the world is today. I suspect we don’t truly get how far our ripples do go out. If we were to feel the expanse of the reach I think we would have a different view as to how we move. Ariana that’s true, like we get a sense of it but if we really understood the effect of each ripple we would be very much more aware of ourselves and all our movements to the point that it would be the most important teaching at school and home and our education system would talk about the maths of movement and effects not just the maths of theory. “What matters is how we treat, care for and respect ourselves, as this is what we are then able to bring to all our relationships with others” – Well said, and so in order to be everything we can be in our relationships we have to deeply cherish ourselves first. What I am learning is to look at the kind of ripples we do send out each day, are they choppy, turbulent or chaotic? For the ripples we send out affects the whole world and they just keep on coming. Relationships are just a way to describe the fact that we are all interconnected, all of the time, and that naturally anything someone else chooses is going to affect you. ‘Who would have thought that relationships and their ripples would have such a profound impact on life, everywhere?’ Feeling off recently and in need of a bit of support, my sister came round and through her conversation supported me to reconnect and get to a settlement in my body. The ripple was felt this morning when I was able to do the same thing for a friend! We have no idea of the ripples we make when we make our choices, but the thing is to simply know they are there. We can all feel when someone else is angry and often there is a tendency to react and often both parties end up blaming the other for any ensuing fall out but it is harder to acknowledge the impact that we have on others when we kid ourselves that we are masking what we feel. Committing to taking responsibility for the ripples that I am creating has led to much more harmonious relationships in all areas of my life which not only gives the opportunity for more intimacy but also makes life simpler. Responsibility is not just doing our work, meeting deadlines or paying our tax, it is about the quality we bring to each and every moment in our life. And this quality can only come from how we live our life and how we care for ourselves or not. Absolutely Lieke – with our every breath we are creating ripples and so the quality of energy we reflect is either co-created with our Soul or it is created with our spirit… As it is only one or the other from which we are moved and essentially what we then take to all our relationships. 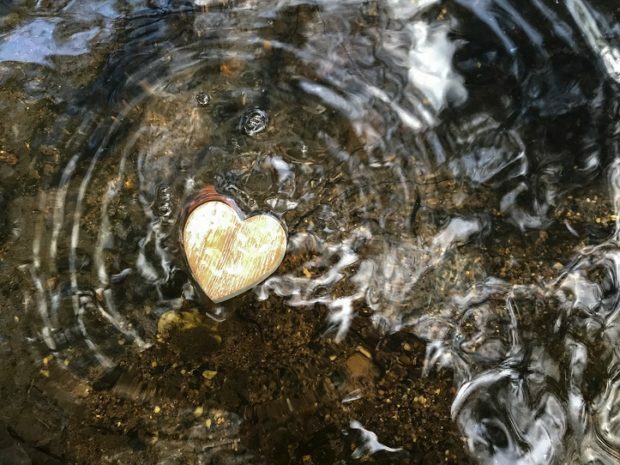 The ripples may be unseen yet they are the initiators of change: a great example that true power is gentle and loving rather than forceful and hard. Often in relationships, we feel the disturbance of another’s movements and then dismiss them without questioning the person if they are alright, or telling them that they don’t feel like themselves or words to that effect. And even though we think there is no ripple effect of this, there always is because it causes a tension in the body for not speaking up and for leaving the other to stew in something that does not need to be stewed upon. Simple things like going to bed when we are tired makes a huge difference as it tells our body that we care about it. Agreed Elizabeth and then we get to look at why we were tired and start to take greater care of ourselves. The same goes with simple things like when we cut out the caffeine in our diet we get to feel if we are really able to keep going or if our bodies are tired and we just kept going because of the caffeine. “the consistency and willingness to keep going deeper with oneself and others that keeps us evolving. ” So true and so beautiful to feel our relationship with ourself with care love and connection to our bodies naturally from within. The grandness of who we are is not so well recognised. From that grandness the ripples go ut to vast unknowns as long as we can get self out of the way. Recently I became aware that basically I have brought in reactions that lead to frustration in my marriage of 28 years, an ill pattern that definitely had a ripple effect on our relationship and on our children and more outward as well. So to bring in my responsibility to not act in the reactions I maybe have now and then but to honour the rhythm of our loving relationship is what is next, doesn’t say I cannot reflect on what is happening in my life with my partner but without dumping it on him or others. “Relationship Ripples” – great every day examples here Amina that show how the way we are with ourselves is the way we are with another too to then receive the same quality back. I experienced the other day at work and with the hundreds of people on the underground system… how that when I give myself space that space is given to me and the people automatically subconsciously respond to this quality making walking through crowds that much easier! With the choice to deepen our relationships we change the world from the ground up. One ripple at a time, and yet do we see the power in that? When i think of a ripple I see it as near endless. One ripple affects far more people than we often consider. As the pebble falls into the water sending out ripples upon ripples to the furtherest bank so to do all our choices in everything we do and say how we hold our bodies ripples out across the sea of humanity and then comes back to where it started, such is the responsibility we have in living our daily life. We are constantly creating ripples and we can so easily ignore that … we think we’re islands yet we’re not, but if we did stop and feel how we are we give ourselves space to see what is next and what is needed, that stop is key, for without it we continue helter skelter as we go about our days. If in life the one thing we say we want more than anything is love, and then we make life about love first, i.e. we build a body of love then all our relationships will be love and so rippling out to the world is the possibility that relationships can be about love first and foremost. It makes sense that if we move in a certain way we make ripples as we move. So, if we move in anger, it is the anger that ripples out to others even if we pretend we are not angry. And in total contrast if we move in a loving way it is this love that ripples out. When we understand this the next knowing is that we are therefore responsible for how we move, in every moment, for no one is untouched by our ripples. It is such a great image of the effect of movement on water it’s undeniable.